The Nomadic Shelter is an interesting piece of dwelling. Meant to be a temporary shelter, it’s an architectural project built as part of Salt festival. The shelter is small, measuring only 12 sq m. But don’t let the small size fool you as it can accommodate up to 12 people. Timber boxes are stacked on top of each other to form one habitable Nomadic Shelter unit. Each module is made up of simple wooden boxes stacked on top of each other. The boxes are made out of timber logs made water-resistant and weatherproof. The best part about the design is that it’s easily dismantled and moved to another location. One unit can accommodate up to 12 people. Nomadic Shelter isn’t made for full-time living. It is set up for festival-goers, giving them a provisional place to stay. These two words: nomadic and shelter, reflect the very needs of the people from Nordic traditions. The intervention is to create a very simple prototype shelter for fire, sleep and meetings. 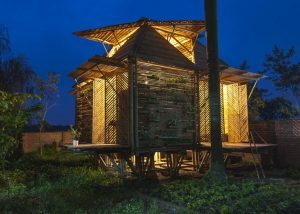 A playful sequence of functional spaces is created using the module of an inhabitable wooden box. These wooden boxes, designed to the dimensions of an optimal comfortable area for sleeping and seating, are stacked around the fire as a sleeping shelter, opening new possibilities of gathering and living. Like in vernacular Lávvu tents the fire becomes the heating core and defines the natural reason to meet with others, triggering conversations across various levels of the building. The shelter is meant to be temporary, easy to transport, expand or mass produce, not only hosting nomads, but being nomadic itself. The building system of has been optimized by using only two modular boxes: 2,40 x 1,20 x 0,80 m and 3,20 x 1,20 x 0,80 m. Thirteen boxes are stacked on top of each other using only manpower and then secured together with screws and straps, reaching a height of 4,80 m and safely accommodating up to 12 people. Through combining different box sizes the interior space becomes vivid and appropriable, yet some of the levels are more suitable to serve as benches or chairs. The stackable shelter connects to the astonishing Norwegian landscape with windows framing the Norwegian Sea and the mountains and a northern balcony, a very unique viewpoint towards the midnight sun. Each box is built up from a corner finger-joint of 2×4 inch timber logs fixed with screws. An outdoor cladding layer out of overlapped 1×4 inch planks makes each box windproof and waterproof against the harsh cold Artic weather. This simple and logic system merges the high structural strength of the 2×4 inch timber logs with relatively lightweight modules and a uniform visual aesthetic quality. The layout can be reconfigured, to upscale or downscale the final volume, while the boxes are easy to unstack, transport and reassemble. The ease of construction and the choice of materials, which can be reused or recycled, enhances the temporary feeling of the built space and makes a strong sustainable statement.